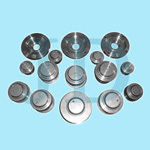 studs,plates manufacturer and studs,plates supplier--China Ningbo Jingda Hardware Manufacture Co., Ltd.
We manufactured a full range of studs and washers, studs, plates which are one of important precision components of compound roller bearings, 20-100mm in diameter and 30-500mm in length. These products are processed by turning, drilling and grinding after precision lost wax casting, they are very good welding performance as well as high tolerance dimensions. We welcome the business of casting machining parts or precision casting products, studs, plates.